The Zohrab Information Center now holds the largest and most expansive collection of Armenian liturgical calendars in the Western Hemisphere thanks to the recent donation by Rev. Fr. Arten Ashjian. The Zohrab Information Center’s library has been enriched by the donation of over 100 daily liturgical calendars from the personal library of Rev. Fr. Arten Ashjian of Yonkers, New York. Known as Oratsooyts, the pocket-sized calendars are published by the major hierarchical centers of the Armenian Church and provide the dates and other information necessary for the proper celebration of the feasts and saints’ commemorations of the Armenian Church. 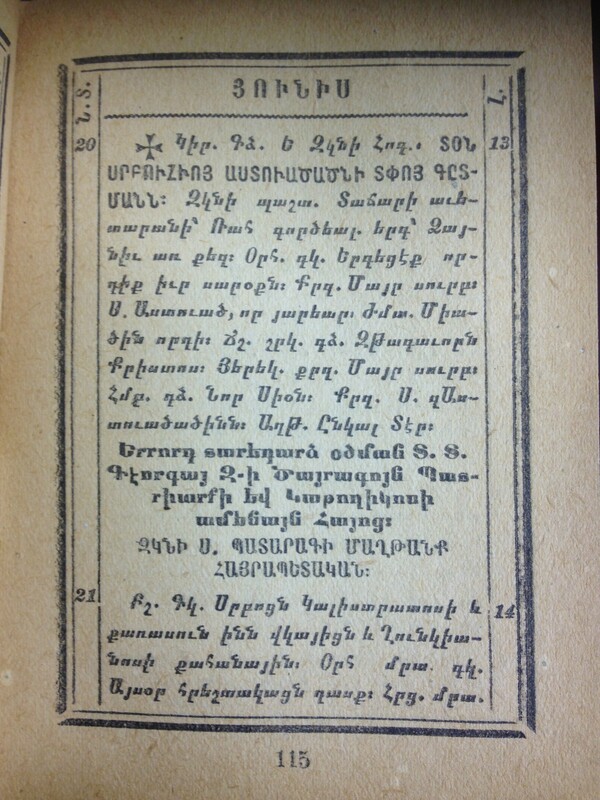 The Ashjian Collection contains Oratsooyts volumes printed by the holy sees of Etchmiadzin, Jerusalem, Constantinople, and Antelias, as well as local church calendars issued by St. John the Baptism Armenian Cathedral in Paris, the Armenian Hospital of Istanbul, and others. Included as well are priceless calendars published by the Diocese of the Armenian Church of America in Boston in the early years of the 20th century, before the Diocesan headquarters moved to New York. A page from the 1948 Oratsooyts of Holy Etchmiadzin showing the entry for Sunday, June 20, the feast of the Discovery of the Jewel Box of Mary the Mother of God, and the third anniversary of the consecration of His Holiness Georg VI as Catholicos of All Armenians. The Armenian Church’s yearly festal cycle is highly variable. Not just Easter, but most saints’ commemorations and other feast days like Pentecost, Ascension, Palm Sunday, the Exaltation of the Holy Cross, as well as the annual celebrations of the saints, change each year according to a complicated interplay of solar, lunar, and daily cycles. Major Armenian Church centers publish their Oratsooyts each year to designate the correct date for all of these festivities. Why bother stockpiling decades-old liturgical calendars? The real value of old Oratsooyts booklets is not in the day-to-day details of church services in years gone by. 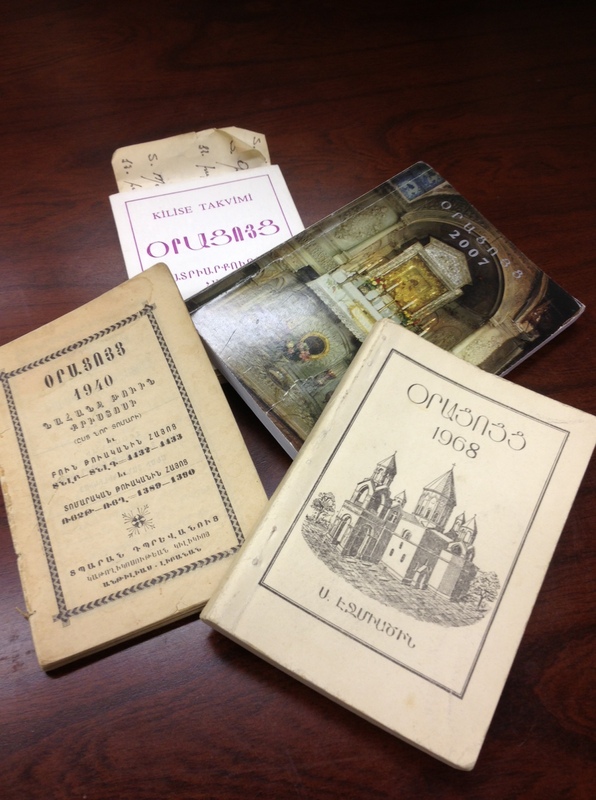 The Oratsooyts also contains registers of active clergy, their current positions and ministries, details about local Armenian Church communities, and other priceless historical information. Who was the director of the Printing Press of the Holy See of Etchmiadzin in 1959? Where and when was Archbishop Georg Arslanian born? The Oratsooyts is the source to consult. Rev. Fr. 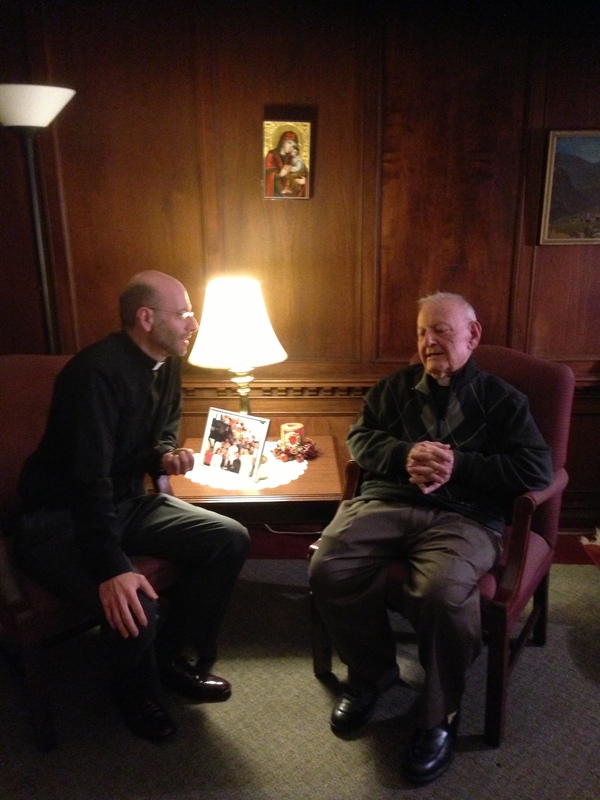 Arten Ashjian (R) speaks with ZIC Director Fr. Daniel Findikyan about his Oratsooyts collection. Rev. Arten Ashjian is the most senior clergyman of the Armenian Church in North America and possibly the world. Born in Aleppo, Syria in 1919, he studied in the Seminary of the Armenian Patriarchate of Sts. James in Jerusalem. Arriving in the United States at the invitation of then Primate Abp. Tiran Nersoyan (†1989), Fr. Arten continued his studies, earning graduate degrees from the General Theological Seminary in New York, and Harvard Divinity School in Cambridge, Massachusetts. He and his gracious wife, Yeretzgin Mariam, have lovingly served numerous Armenian Church communities in North America during a long and distinguished ministry. He continues to officiate at Holy Cross Church of Armenia and St. Nersess Seminary in New York. A genuine bibliophile, Fr. Arten is also one of the most prolific authors among the clergy of the Armenian Church in America. His numerous books, in Armenian and English, are housed in the Zohrab Center (enter Arten Ashjian and select author). Fr. Arten’s collection of Oratsooyts’s enriches the Zohrab Center’s existing collection of this unique genre, which includes volumes as old as the mid-nineteenth century. The collection can be accessed via the Zohrab Center’s on-line catalog (enter ōrats’oyts’ or calendar and select subject). The collection is also available for personal inspection and study by appointment.